First off, I would like to apologise to readers that this review has taken so long. There has simply been so much going on that it has been hard to find the time to prioritise it. I had this shirt made last year, following two visits to Paris - one to be measured, and one for a fitting. It was made in a fine cotton with a subtly shaded, closely patterned blue stripe. The cloth is exclusive to Charvet, as most of the hundreds of bolts in the shop are, and this is undoubtedly one of the big selling points of the house. 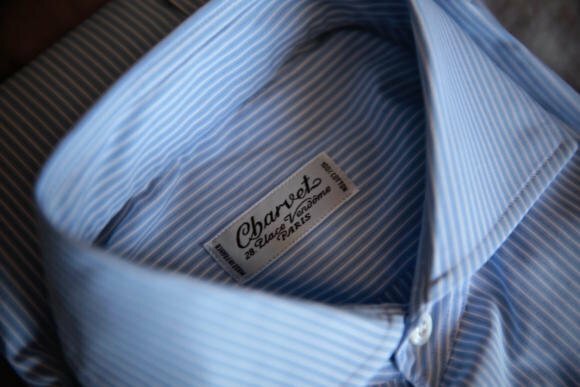 You have to really care about your shirtings to want something that none of the standard books, offered by most shirtmakers, have available; but if you are one of those people, few places in the world compare to Charvet. The staff, particularly Jean-Claude Colban himself, are also extremely knowledgeable, and can help the shirting obsessive get deep into shades of blue and casts of white. There is a clear attraction, then, in the materials and in the Place Vendome shop itself, which is one of the last great bastions of traditional menswear. 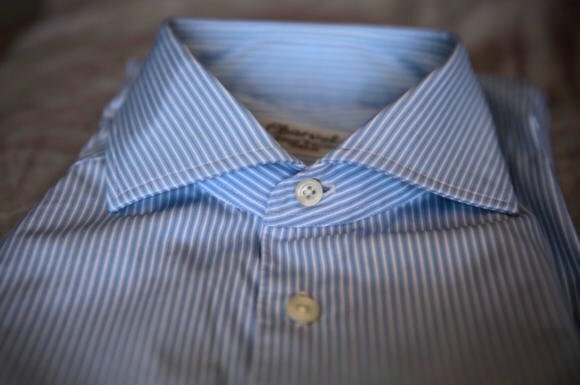 Charvet are also unusual in not requiring a minimum order for bespoke shirts - many require three, four or even six shirts the first time, to effectively cover the cost of developing the customer's pattern. But beyond these points - and a last mention of how much I have appreciated the hospitality of Jean-Claude himself - it is hard to be that positive about the shirt. Particularly given the price point. The fitting process at Charvet was more involved than any I have experienced elsewhere - as mentioned in my first post. There was a fitting shirt in a cheap cotton, but rather than just pinning the changes on it or marking them on in pen (as others have done), the cutter used shears to cut away at the cloth, slicing sections and taping them back together. This made it much easier to adjust the balance of the shirt - making sure the back and front were sitting at the same length. And there is a noticeable difference in the fit of the final result. The balance is probably better than any other first shirt I've had from a bespoke maker. But while the fit is very good, it's not perfect. The shoulders could do with being raised up a little, and being pushed back to avoid pulling slightly at the neck. The area the shirt particularly suffers is make. There is no handwork involved other than hand-attached buttons and hand-finished buttonholes. So the functional aspects (attaching collar, attaching sleeve) are all done (with great precision) by machine. Attaching a collar in the round doesn't make a lot of difference (and certainly less than equivalent handwork on a bespoke shoe or suit) but it does make some. The reason Charvet shirts don't have much handwork, of course, is that the shirtmaking tradition is more akin to the English one than the Italian, where everything is about the cutter and the fit, rather than the make. English bespoke shirts usually don't have any handwork at all. Lastly, I have some issues with the style. We talked through many different spread-collar options - widths of spread, length of point, height of band - before settling on this one. Jean-Claude and his assistant suggested in suited the proportions of my face. Having worn it several times, and considered their points, I believe it's a good option but I prefer my normal style with a higher band. You can see in the image above the height of the band, which is about 3mm smaller than my normal height. Again like English shirtmakers, Charvet shirts usually have floating linings in the collar and cuffs. I tend to prefer the light fusing of Italian collars, because they are cleaner, no less comfortable, and adapt to how they are worn - a spread collar like this would roll around the collar of a jacket, for instance, and therefore look attractive even without a tie. Jean-Claude suggested I try the lightest of their floating linings. But if anything that was the worst of both worlds: it still had the disadvantages mentioned above but with a softer, less clean finish as well. A Charvet bespoke shirt starts at €580 (made to measure €460). Not only is that objectively a lot of money, but it is more than all the English competitors, and a lot more than the Italians I usually cover. 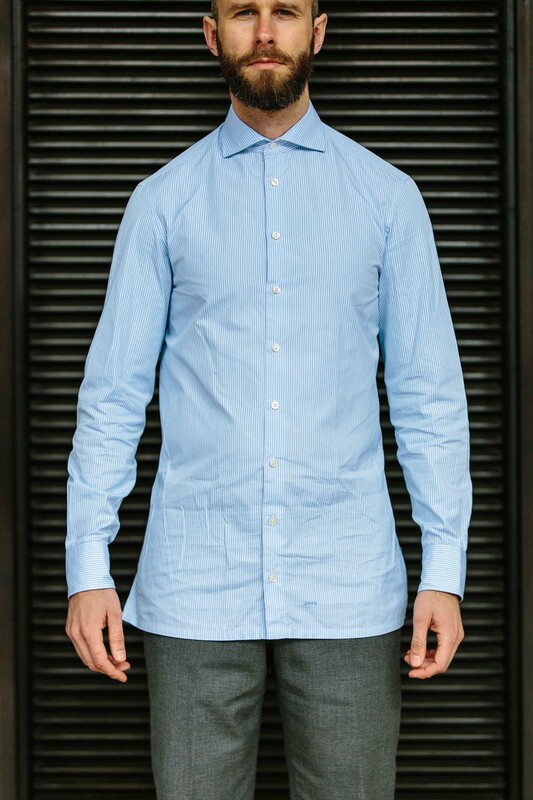 At the top end, a D'Avino shirt costs €350 (though with a minimum first order of three) and is simply a work of art in terms of the handwork involved. Below that, Luca Avitabile is around €250 and Simone Abbarchi €150. All different services, all good value for what they offer. Unfortunately, as much as I love Charvet and hope their Place Vendome shop is there forever, it's hard to say that about this shirt. Shirt worn with navy-tweed jacket and grey Crispaire trousers from The Disguisery. Review of them coming soon. You can follow the discussion on Charvet bespoke shirt: Review by entering your email address in the box below. You will then receive an email every time a new comment is added. These will also contain a link to a page where you can stop the alerts, and remove all of your related data from the site. Your ‘pickiness’ knows no limits LOL. You’ve just laid into the poshest shop I have ever set foot in!! Your honesty keeps bringing me back to this blog . I think the price factor mentioned at the end of this highlights precisely your misgivings. Although the service from Jean Claude is legendary . Gave up using Charvet some years back as the prices got a bit silly. Found a maker in India who copied, and now faithfully reproduces their cut in my choice of fabric to produce a virtually identical finished shirt at a fraction of the price. Geeky point Simon, but your collar shape looks very close to my formal collar. Care to share point length, front and rear stand height and spread? Would you mind telling me the name of the tailor so I can try it out? Reluctant to “advertise” on your site without appro. Go ahead Nick, that’s fine. Just don’t take this thread too far off topic! Once they know exactly what you want, they will make it. I have shirts and trousers (they carry Dugdale and VBC cloth) and have been very happy with the service. Ever been tempted to use them for a work jacket or something else? How exact do you need to be with measurements? Always happy to take this offline / to another forum as I have lots of questions about services like this! If you wouldn’t mind guys, that would be great. Happy to try it myself and some point if a PS review would be helpful. A review of Luxire from PS would be great indeed. It has been named a lot in styleforum and for the price they deliver very good quality. Really appreciate your honesty by the way. I’ll second Fernando in requesting a review, please . I’m not going to get involved any further, other than to say go to the website and follow the prompts. Simon if you do decide to try them I would be fascinated to see your view on price /quality /value. Would also love to see a PS review of Luxire, and maybe Proper Cloth too…? I realize both are probably well below your normal quality levels (and I love the shirts Luca Avitabile has made for me) but I do think it’s useful to have cheaper options for knockabout shirts or unusual patterns/styles. How would you compare Charvet to Ascot Chang? I haven’t had bespoke shirts made by Ascot Chang, so I can’t really compare. They’re a well-known name because they advertise, not because their product is anything special. And regarding the latter, the rap on them is that what they call bespoke is really just a reworking of basic made-to-measure shirts—and that their prices, while not at the ridiculously stratospheric height of Charvet, are still ridiculous for what you get. I actually think this looks great. I have 5 Charvet shirts, acquired over the years on occasional trips to Paris. None are bespoke, but I am very fond of them, and will say in their favour that they have lasted better than any other quality shirt I’ve ever bought. You do pay for the experience, of course, the tour of the workroom and the ego massage, but it is a pretty wonderful experience. And were you not aware of the lack of hand work when you made the commission? It’s interesting that the key quality aspect men refer to with shirts is their longevity, given that most shirts of all qualities are made with machine stitching that is exactly the same. Indeed, more expensive shirts tend to use finer materials that will not last as long as cheaper, coarser fabrics. I agree. It’s also usually the case that because shirts sit next to the skin, they ‘should’ be replaced fairly regularly. Perhaps I sweat more than most (!) but in my experience armpit stains will necessitate replacement long before the fabric elsewhere starts to show wear. The stains you refer to are the result of your anti-perspirant most likely; the aluminium compounds. A few years ago I started to use a stick deodorant made by Malin & Goetz. It is anti bacterial and uses tea tree oil and eucalyptus. It takes a couple of days use before it kicks in properly, but I’d never use anything else now. No stains at all so I suppose shirt life is extended too! Thanks Nigel, good to know. Will look into it. The best way to prevent shirt staining and to prolong the life of your shirts is to wear a short-sleeved undervest. I find they also help to regulate body temperature by wicking away sweat effectively or, at colder temperatures, creating a better thermal layer than the cotton of a shirt. On that point, I work extremely long hours in a shirt all day. For day to day work I use Charles Tyrwhitt, and then have a few nicer shirts for occasions, big meetings etc. Machine stitching … while common in almost all shirts in that it’s done on a machine, appears to me to vary significantly between low-end shirts and shirts like Jean-Claude and the team at Charvet produce. I have about 70 by them (many up to over 28 years old — OK, it’s almost an illness) and can tell you the fineness of the stitching knows no equal. And, that level of make, combined with the quality of the fabric and (likely) my washing and hand pressing, have resulted in tremendous life span and a very low lifetime cost-per-day worn. And, they are a joy to wear. I like and wear and have other bespoke and rtw shirts, too. But, there’s something about the Charvet make and the look and the fit that makes them my favorite. Thanks Mark. Very useful, though having 70 shirts to revolve through would help the longevity of any collection I guess. Also, it’s fair to point out I think that I have never had a seam on a shirt come undone – on any price, from Charvet down to the cheapest. So fineness of stitching is largely about aesthetics rather than functionality. I agree on your observation on the stitching, Simon. I would also say that the overall quality of many RTW shirts — even at relatively high price points — seems lacking in recent years, especially those that have off-shored their making to the Far East. Case in point: I have two Thos. Pink shirts that are about 20 years old at this pint. They were from when they made in Ireland. They are holding up beautifully. The 140s two fold long staple cotton feels super nice, and the construction is quite nice. The fit is not so great — baggy torso, etc. But, I recently tried on a shirt by them made last year … It seems like absolute junk, comparatively, and I wouldn’t buy one. A good excuse to add only the items I really want. Then again, my spouse is trying to impose limits on my adding more suits, jackets, shirts, shoes, ties, tennis racquets and bicycles. Lol. Thanks Mark. What specifically makes the new shirts feel bad? Simon: On an only semi-related note, from some entries on your brilliant blog and site, it seems that maybe we share the same cutter at Poole’s, Alex Cooke? He’s really been great on my things since he started working with me about 15 years or so ago, now. Have to say that the price seems difficult to justify by any objective measure. Suspect that their location means that they are aiming at the ‘more money than sense’ crowd who see price as totally irrelevant and want the cache that is conferred by buying bespoke clothing from premises located on the Place Vendome. Hi Simon, an interesting post – not only as a critique of a Charvet bespoke shirt, but also as a philosophical piece on how much more satisfied one should expect to be with a €580 shirt as compared to one for €150. Also I see you had your initials stitched at the waist – I have always been unclear as to the benefit of having initials on a shirt? 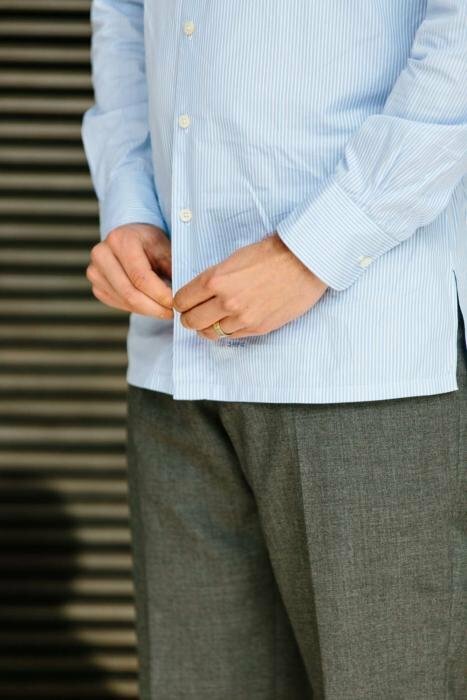 Shirts have no financial value after they are purchased and so unlike a watch, cufflinks or silver brush marking a shirt for security purposes seems unnecessary. A purchaser of a bespoke shirt is also unlikely to be living in a public institution where garment identification is required for general laundry. Presumably the owner of the shirt knows his own initials already so is it just a vanity? I don’t have a problem with vanity or affectation, but we do not mark suits, shoes, socks or ties so overtly, so I was just wondering why people choose to mark shirts in this way? Helps you remember your name? Slightly more seriously, it probably dates back to the 18th / 19th century when monogramming was used to denote status among wealthy members of the middle class who lacked the formal coats of arms associated with the traditional aristocracy. I know some tailors are asked to stitch initials on the inside of suit jackets and it’s not uncommon to find initials on handkerchiefs, so it’s definitely not limited to shirts. Honestly, this verdict doesn’t surprise me one bit. I tried Charvet when I lived in Paris and it was one of my most proportionately expensive and disappointing sartorial adventures ever. The have beautiful exclusive cloths. Their blues and whites are spectacular but beyond that the whole gig is a triumph of style or substance. At the risk of sounding like a broken record, I’m not particularly a believer in bespoke shirts. I don’t think they are worth it. That said I do need made to measure and have found Drake’s new service quite good. I’ve had two from their Somerset operation. The service has been excellent. I like their product and I think they have struck a good quality/value equilibrium. Fascinating review of a shop I’ve visited hundreds of times – the belts are nice. What has always put me off upstairs in the bespoke departments is being followed endlessly about six inches behind me by an assistant – in my experience the quickest way to ensure that someone leaves a store empty handed! All my bespoke shirts are from T&A and most of them last at least ten years in sea island cotton in my experience. Some weekenders are fifteen years old. Given that a shirt like this would be worn tucked in, how important is the balance? Mostly asking in terms of relative importance. If I had to choose between good fit at the shoulders, or perfect balance – on a shirt I feel like I’d always prefer to get the shoulders right. Though possibly I’m being unfair to Charvet here – I’m sure they attempted to get both the balance and the shoulders right. The first bespoke garment from a maker occasionally does (inevitably) have small fit issues. And while it’s popular to talk about how such and such a tailor/shirtmaker/shoemaker nailed the fit the first time, I wonder how informative this really is. There is definitely skill involved in nailing the fit the first time around, but I suspect a modicum of luck as well. I’ve found that the right balance does a lot for the comfort of the shirt. My English bespoke shirts, which appear to be of similar make to this at a third the price, have a perfect balance and are the most comfortable shirts to wear. That and the collar position matter considerably. They just move with my body so perfectly. Thanks for the honest post Simon (probably a relief to move on from menswear philosophy). It is a nice shirt but no nicer than many seen here. If anything, as you point out, it seems inferior, particularly the collar style and fit. 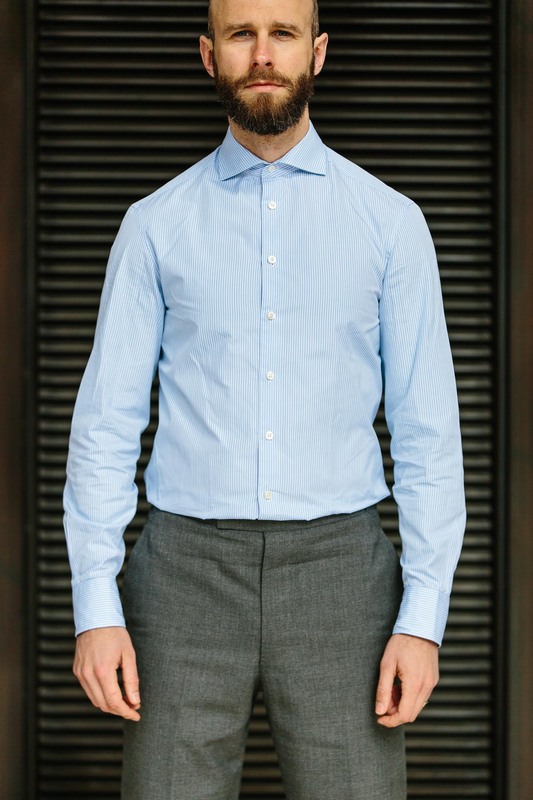 You have a reasonably long neck, any well made shirt collar (even a cut-away) should therefore stand taller. Just a small rejoinder – do the French have a different shirt style to your own sensibilities (which are more Italianate) – if so is the cut off their usual mark? One positive is the cloth – out of interest do they use the Swiss mills or do they have a different provenance. Interesting point. From my experience and what I’ve seen with other French makers, no this is not a national style point. They use Swiss and Italian mills. Is that fabric from Charlie Haughey’s bolt? I have been wearing Charvet bespoke shirts for several decades. While I appreciate your critique and observations, I regret you didn’t didn’t discuss some of their unique attributes. Walking through their store is a delightful experience and their extensive selections of cloths is rather astounding. However, I have not been there for a while and maybe things have changed. Thank you for sharing your thoughts with us. I do mention the wonderful nature of the store, the unique knowledge that the staff bring to shirting selection, and the huge range of cloths. I am careful to list all the things that I love about the store and the service, as well as the issues. Those things also, wonderfully, haven’t changed. This is a clear cut case of “brand” pushing the price of a -relatively speaking – average quality product into the stratosphere, bordering on absurd. Same as Kirin suits for $10K, Borini jackets for $7K and countless other, formerly “artisanal” rooted-makers who’ve discovered the marketing’s worst kept secret, where price and quality are living in two parallel, ladgerly discinected galaxies far far away (from one another). I see same happening to the likes of Luca Avitabile – previously a solid offering at around $170, now pushed up into $270 with no improvements on quality/delivery/fit etc. So I am slowly coming to the conclusion that it’s much better to work with that reliable, local no thrills shirt maker who is half decent and honest at what they do rather than giving business to internet supernovas with the newly found “brand” cashe and ever increasing prices that go hand in hand with that. And if all fails (as things do in my case in Singapore), there is always RTW Borrelli that can be had at $200 or even cheaper… with minimal simple alternations it fits me better than most of my bespoke creations. Thanks for this review anyway. Must have been a bit awkward to write, as you are friends with the Charvet people – good counter evidence to those rude posts that occasionally appear accusing the site of promoting certain brands. You’ve probably saved me 580 euros, as I was tempted by a bespoke Chravet one day, maybe on a landmark birthday. By the way, in my previous post I wasn’t suggesting that longevity is a major concern when I buy quality shirts. It isn’t . I realise they are fragile objects, but was just remarking on how my Charvets have endured better than most – which slightly mitigates against the towering price point. It’s a seductive shop, almost unique, and well worth visiting, but I hope they rethink their pricing. Even with my 20% off (I’m non EU) it’s not great value. Thanks Phil, and understood on the longevity point. These reviews are indeed awkward sometimes, and hard to write, but I do find that open-minded brands appreciate the comments, particularly given they are pretty balanced and objective. Whilst rarely mentioned anywhere, I find 40 Savile Row very good for MTM shirts and have used them for over a decade. Max who runs the place is a great guy. The downside is that the Northern Ireland factory they use will often make mistakes – the upside is that they have no qualms, at all, in remaking something – whether it is a factory fault or just because something doesn’t look as good as you both thought. £200 based on ordering 5, or £250 each. You could probably get the same thing cheaper but you can’t knock the service or the convenient location. Simon, was that a typo on the price of shirts from Luca? When he first started he was at about 150 to 170 Euros and if 250 is correct he has gone up very quickly. Add to that the pound/euro move and he has become expensive very quickly. Regarding Charvet I agree and disagree. The quality of the handwork is not there as you point out but from my experience the fit has been the best of any shirt maker and I have never experienced any of the problems around collar, neck and shoulder that you did. As to longevity when my father died I got his Charvet shirts, a good dozen made in the 70’s and 80’s thankfully to a conservative cut! I still use a couple including the best soft evening shirt I have ever seen and I think I could well be passing that on. While I have not had a shirt made by them since 2008 for formal English cut shirts I think they are superb. I should have said euros. The price over the years has depended mostly on the exchange rate. He’s €250 now, and was €220 when he first started coming to London. Back then the pound was a lot stronger and 220 euros was perhaps 180 pounds. Now, 250 euros is about 220 pounds. sort of Polo Ralph Lauren quality and styling (which is, for some strange reason, is/was very popular in Geneva). Their “logo” – a prancing horse very closely modelled after Ferrari’s, was only adding insult to the injury. For these prices, there is no way any of them were being made in Geneva. Considering that, I doubt you can get even close to MTM (for Geneva-made articles) for less than $250, so $80 sounds simply too fantastic to be true. Hi Evgeny, thanks for your comment. I just had another look at their website and from what I understand the shirts are made in Toledo, Spain, and the fabrics are from Thomas Mason, among others. They say they make personal patterns etc. and it takes about 3 to 6 weeks. I have been a charvet bespoke customer for 30 years. Fabric choice is unmatched. Personal service and willingness to work with client to get it perfect also unmatched in my book. Maybe they don’t win on economics in many books but for me, they have no equal on this earth. They feed my soul. This is priceless. I agree with Brian, the desire to get everything absolutely perfect how you want it as the client makes them the best experience I have ever had (I see Lorenzo when working with my shirts). The attention to detail is at a level that others haven’t even come close to matching (of the other mainstay shirt makers I’ve tried). As mentioned, the relationship part is key and admittedly it did take a few fittings before my pattern honed in on the perfect fit, but this is no different to other bespoke makers. There is no other like Charvet. I would rather only have a handful of shirts that I love versus many that I know just aren’t equals. Yes, it is very expensive, but I love the experience, the attention to detail, the history; Brian nailed it – they feed my soul, priceless. Hi Simon, how would you compare Charvet to Anto Beverly Hills? I live in Los Angeles, California. I understand. Thank you for the quick response! Anto is better. Better collar, fit, balance. Anto was and is preferred by all the greats. Available only in LA. Durable as hell, last forever and best personalized service in the world. Bolts galore in the store or anything you like can be ordered. Swen, thank you for your comment! I have also really appreciated the service and quality at Anto, but I have never had the opportunity to visit Charvet. Great review; I wasn’t too surprised by the conclusion either. Even though I’m a big proponent of bespoke shirts (I must have weird proportions because MTM never seems to work) I can’t imagine how that price level could be justified for any shirt, which is never going to have the longevity of a suit or pair of shoes. I often wonder the same about Alex Kabbaz shirts, which also seem to be insanely expensive. Would you say Avino is still your favourite of all bespoke shirt makers? Secondly, if what I’m really interested in is a shirtmaker who can tweak minor things like collar size/width to better suit my body (disproportionately large head/narrow shoulders), would Charvet be a better choice than the Italians that you have mentioned? Yes, but purely on make rather than fit. Luca is just as good on fit. you wrote about “handfinished buttonholes”. What do you mean ? As these buttonholes are clearly not handsewn. Handfinished….means ? I do have some CHARVET shirts and they last beautifully, I like pretty much their quality. I also have some others bespoke that I buy from an important shirt maker in London, but CHARVET ´s are not so much far behind. I’v had English, American and Charvet bespoke and in my opinion, Charvet leads. The sea island cotton from Charvet is extremely comfortable and well made. Only Charvet matches the stripes, I have seen no one else do this. And Michelle has a keen eye on minor details one misses. Charvet wins. Simon, I hope you don’t mind one other review request: for Frank Foster. I know he has died, but his wife and daughter I gather are still running the business and their choice of cloths, if haphazard, is also legendary. 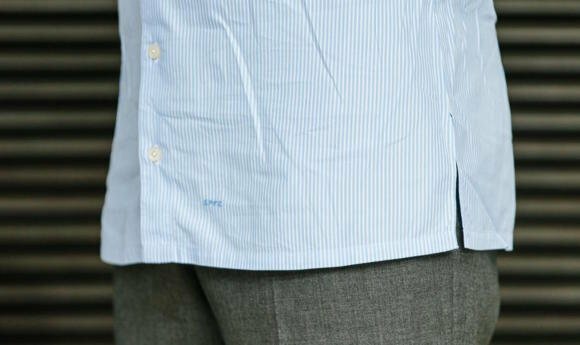 There are also unusual features to their shirts, such as the bunching of the sleeves at the cuffs, which you don’t find in other English shirts. Also interested to hear if anyone on here has anything to say about Foster shirts compared to Charvet and others. I could not disagree more with this review of Charvet. I have spend $1000s at T&A and numerous Italian bespoke shirtmakers….numerous refittings. Charvet was the only one who got it right the first time out. Perfect fit, excellent fabric selection and service that leaves Jermyn Street behind. I’ve dealt with Charvet for years now and have never had a complaint. Pricey…?…Yes, but they get it right and if you can afford it…a trip to Paris is worth the experience and the product. Any experience with Wil Whiting? London-based shirtmaker, who puts considerable handwork into his shirts. Being London based he’s more expensive than the Neopolitans, but his highest-level shirt has considerable more handwork than Luca’s. Considering the height as measured in the back what should be the difference between the shirt collar height and the coat collar height (for someone with a slightly long neck)? I am from Paris and have also tried the best bespoke makers here. I had my WORST experience in shirt making with Charvet. First of all, if Jean Claude Colban does have a true knowledge, it isn’t the case of all the people involved in the store when you walk in and go up to the shirt making floor. Most of them are very very average sellers, and this does not reflect the price of the bespoke experience. For instance, the woman who was in charge of my fitting process was in complete disagreeement with her boss, who had to correct all the measurements as the first ones were way too tight. The choice of cloths is impressive but very few of them qualify for the “entry price” and in the end most of the shirts cost almost 800. The make is not good at all and the service was terrible when I collected the shirt and complained about the fit. I came back 2 weeks later and asked if it was possible to check measures on their books (as the fit of the shirt looked so bad) and they got pissed off and were not able to show a professional reaction. Price is ridiculous compared to the excellent COURTOT (rue de Rennes, Paris 6) a very talented professional, always nice and welcoming. Jean Manuel Moreau shirts made by Mazarelli in Italy and Camps de Luca shirt offer are also very good. Simón does any of your shirts have curved sleeves like in a bespoke jacket? Just curious. I have MTM shirts with rotated sleeves but never heard of the former. Mr. Crompton, I understand that a 100% cotton shirt wrinkles, but is there any cotton that does not wrinkle so much after ironing? There are people who believe that a shirt is of poor quality because it wrinkles a lot and is a headache. style, a straight point for example, would be better suited to you. Hi Simon. I will be picking up my first bespoke suit (W&S Classic) in January. I am looking into getting some bespoke shirts now. Charvet is out of my price range. Do you have any experience with Maison Courtot or Clotilde Ranno? I have been to Charvet and after being carefully measured, have purchased several shirts by email each year. I need a pocket: the shirts are made with a pocket. This year, I asked for a slightly shorter collar (never the silly spread collar). I got the same body with shorter collar. Ive asked for summer blue broadcloth-five swatches with different shades arrive a week later. By now I have over a hundred winter and summer, dress and sport styles that fit perfectly and always look sharp. Worth every penny —and I’ve never worn one out. Of course you’ve never worn one out. With 100 shirts, you hardly ever get to wear the same shirt twice. You’d have similar durability with 100 shirts from any other decent company.